MAGMA immersion heaters are primarily designed to generate all heat immersed in liquid or gases which are installed in a tank or container. These heaters are virtually 100% energy efficient. These versatile heaters can also be formed and shaped into various geometries for radiant heating and contact surface heating applications. 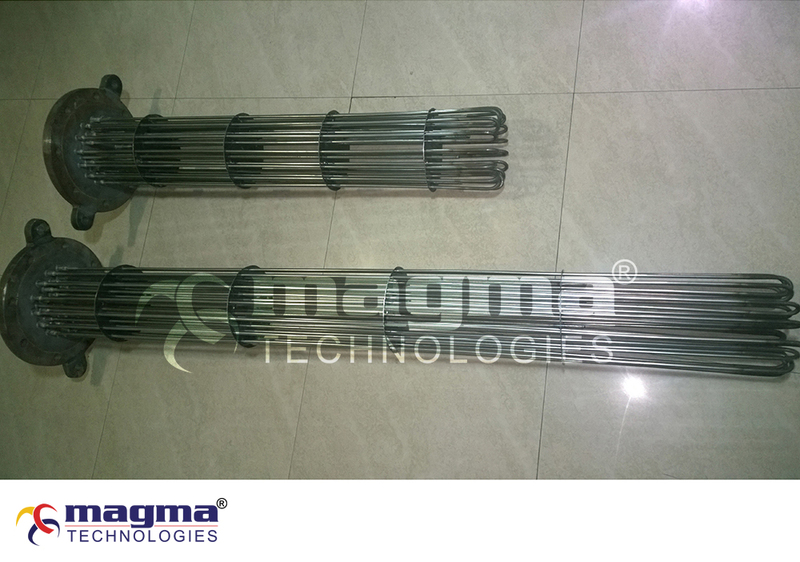 MAGMA has extensive experience with custom designed immersion heaters for tank, reservoir and circulation flow applications. They are constructed of one or more heater elements of various lengths & dimensions, diameters of tubes which are brazed or welded into numerous different types of mounting fittings as per requirements. Hot water and steam are required for numerous industrial and commercial applications. For a good percentage of these, an immersed tubular heating element is the most efficient, inexpensive and robust solution. Standard or custom engineered designs are available for tailored solutions to application requirements. Installation for various applications can be over-the-side, flanged and threaded or screw plug immersion heaters. One of the most widely used method for heating liquids such as water, oil, heat transfer fluid and corrosive solutions is MAGMA Flanged immersion heaters. This method is energy efficient and easily monitored and controlled. They are designed for use in tanks and pressurized vessels. MAGMA Flanged immersion heaters are easy to install and maintain to provide heat for many processes. These through-the-side immersion heaters utilize standard pipe flanges of various ranges in diameter to support high tank pressures of liquids. They are installed through a matching companion flange, obtainable from local industrial supply houses, to the tank wall. Many different alloys used in the MAGMA flanged immersion heaters allow the flexibility to help resist corrosion and maintain life longevity of the flanged heater. Steel flanges are typically used for lubricant oils, heavy and light oils, waxes as well as mildly corrosive liquids and low flow gas heating. Applications of steel flanges are process water, soap and detergent solutions as well as de-mineralized or deionized water. 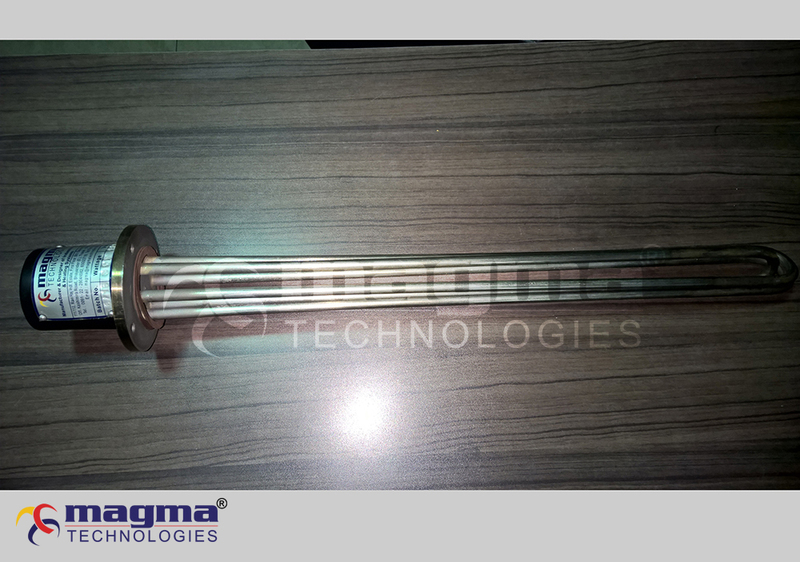 Stainless steel flanged heating elements are used with mildly corrosive solutions as well as severe corrosive solutions. Food applications use stainless steel for sanitary purposes. The sheath materials used can be steel, stainless steel, copper as well as exotic alloys such as Inconel, hast alloy and titanium. Extremely corrosive environments such as salt water should use exotic alloys such as titanium to avoid sheath breach over excessive durations. Industries that use exotic alloys can include military, Chemical and process industries. 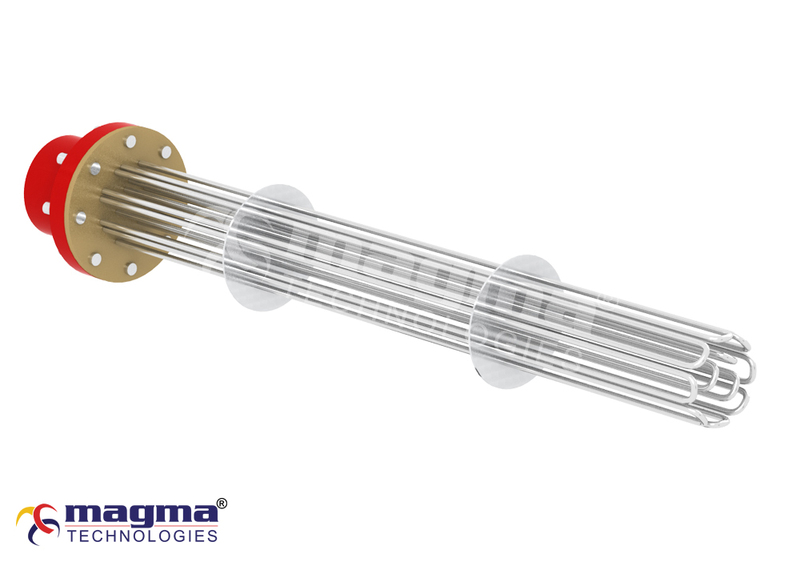 MAGMA offers flanged immersion heaters in varying kilowatts ratings, voltages, temperature ranges, sheath materials and so on. A wide selection of watt densities, heating outputs and flange sizes and ratings make this an excellent heater for all tanks, or irregularly shaped vessels. Typical applications include preheating different grades of oil, cleaning tanks and heat transfer. VOLTAGE MAGMA flange heaters are custom-built and supplied with voltages up to 600V. 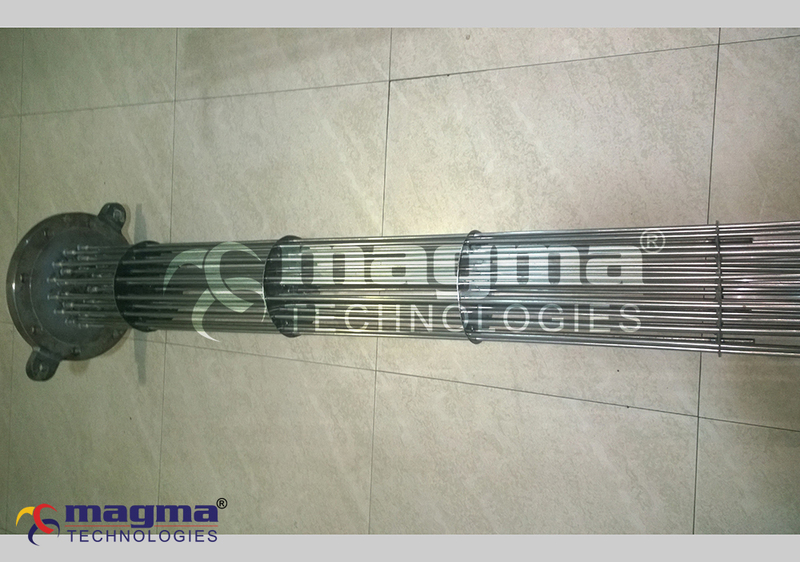 LENGTH MAGMA flange heaters are supplied with unlimited immersed lengths.When the immersed length exceeds 50”, it is recommended to install an internal vessel support. Electric Immersion heaters may heat water immediately adjacent to the heating element high enough to promote the formation of scale, commonly calcium carbonate, in hard water areas. This accumulates on the element, and over time, as the element expands and contracts through its heating cycle, the scale cracks off and drops to the bottom of the tank, progressively filling up the tank. This reduces the tank's capacity and, where the immersion heater is secondary to the heating of the water by a coil fed from a gas or oil-fired boiler, can reduce the efficiency of the primary heating source by covering that other coil and in turn reducing its efficiency. Regular flushing-out of accumulated sediment can reduce this problem.Such problems can be avoided at the design stage, by maximising the amount of hot element in the liquid, thus reducing the watts density. This reduces the working temperature of the surface of the element, reducing the build up of limescale. So watt density has to be revised as per application. Prevent excessive temperatures in process applications. A reliable temperature control system is imperative to the performance and life of your heaters.The temperature sensing device should be located in a built-in thermo well for maximum accuracy and responsiveness.The protection of a high-temperature limit control can be very important, especially when process temperatures are critical. Contamination is the most frequent cause of heater failure. Any organic or conductive material if allowed to collect at the lead end of the heater, contaminants can cause an electrical short between the power pins.Do not allow lubricants, oils, low-temperature tapes or processing materials to remain in contact with the lead end of the heater. Specify a moisture seal if necessary. Protect leads from damage by high temperatures. Standard fibreglass-insulated lead wire may be used to approximately 500ºF (260ºC) ambient. If the lead will be exposed to higher temperatures, high-temperature lead wire or ceramic bead insulation should be used. Ground the equipment. An unheated section of the heater, protruding from the heated part, could enable the leads to run cooler. Protect leads from damage by excessive movement. Anchor the leads to prevent heaters from being damaged when they are mounted in moving machinery. Excessive cycling can be very detrimental to the life of a heater. The worst cycle rate is one which allows full expansion and full contraction of the heater at a high frequency (approximately 30 to 60 seconds ON and OFF).With simple ON/Off controls, much less frequent cycling can be achieved by closely matching the total wattage to the actual requirements. Make sure the sheath material and watt density ratings are compatible with the liquid being heated. Do not locate the heater in a restricted space where free boiling or a steam trap could occur.Immersion heaters used in tanks should be mounted horizontally near the tank bottom to maximize convective circulation.Vertical mounting is possible where limitations prohibit horizontal orientation. Both methods must be located high enough to be above any sludge build-up in the bottom of the tank.Scale build-up on the sheath and sludge on the bottom of the tank must be minimized. Heater selection and sizing are important. Match the heater wattage as closely as possible to the actual load requirements to limit ON/OFF cycling.For fitted-part applications, specify the heater size exactly so it can be tightly fitted. Even small air gaps cause hot spotting.Its common sense and a safe practice to electrically ground all equipment which protects plant and personnel in case of any electrical failure in the heating system. It's common sense and a safe practice to electrically ground all equipment on which the heater is used. Grounding protects plant and personnel in case of any electrical failure in the heating system.